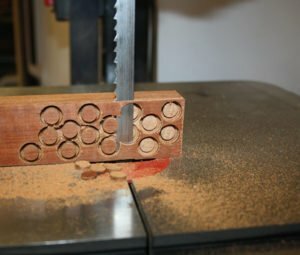 If you are interested in how to make fret dots in the shop, this article is for you. Fret dots are commonly made from mother of pearl or abalone, but there are other options. 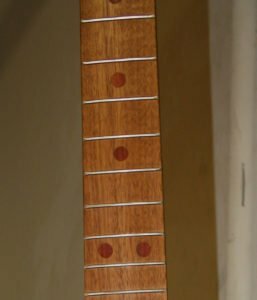 On a custom guitar, a set of handmade exotic wood fret dots is a really nice touch, and easy too. Here is a small selection of the fret dots that I have in my shop. There is Mahogany, Walnut, East Indian Rosewood, Purple Heart, Goncalo Alves, and Maple. These were all made from scraps from other projects, which means the fret dots were basically free. Having smaller projects or secondary projects that make use of smaller scraps is a good practice. In this case, my acoustic guitar making wood scraps don’t go to waste. I use larger pieces for bridges and for peghead overlays, and I make some bridge patches for under the soundboard as well. When you know how to make fret dots in the shop, you will be able to use almost any species of wood to create a custom look on the fretboard. In cases where a standard Rosewood or Ebony fretboard is used, a nice set of exotic hardwood fret dots can enhance the look. 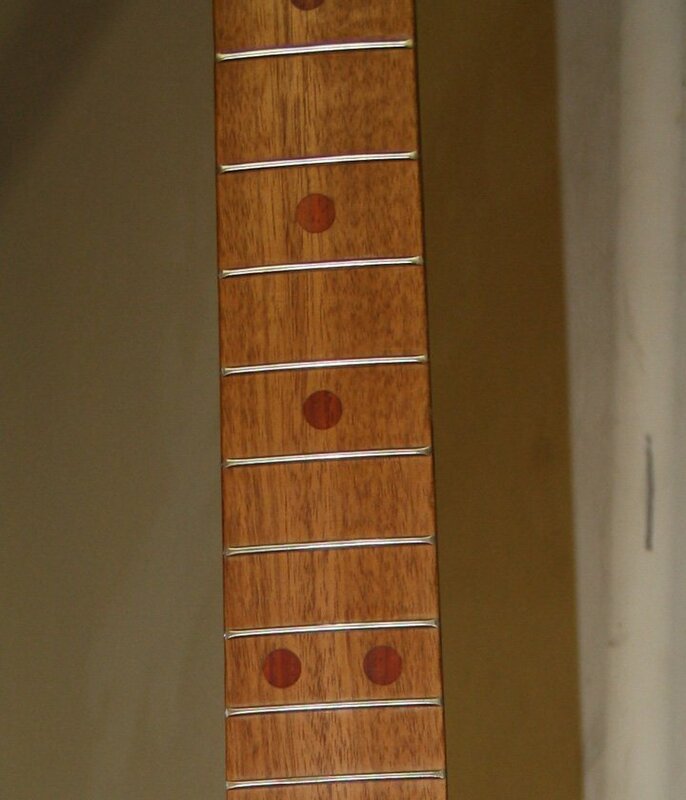 A set of Padauk dots (which are deep red) look amazing on a darker fretboard. For use as an alternative to white plastic dots or mother of pearl dots, Curly Maple makes an excellent choice. The first step in how to make fret dots is to find a plug cutter. These come in many styles and designs, and it is important to get the right kind for the job. Some plug cutters cut tapered plugs, and some cut cylinder shaped plugs. 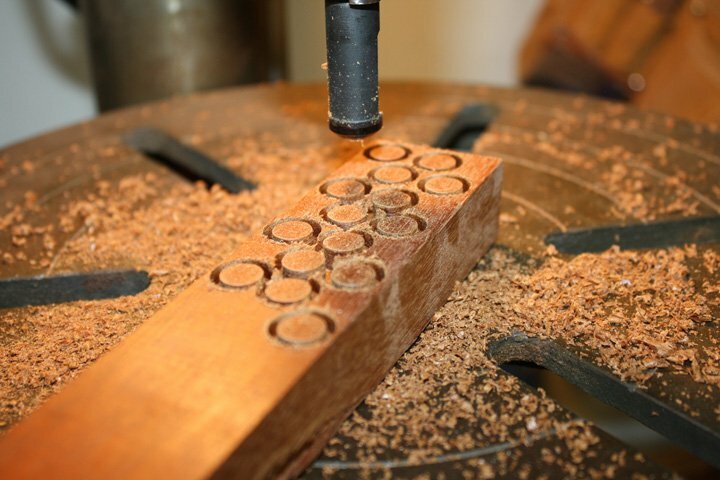 For making fret dots in the shop, a plug cutter that creates a cylindrical shaped plug is the best kind to use. Since the hole for the dot will be drilled with a Forstner bit, the inlay needs to have straight sides in order to fit properly into the cavity. These are available in a number of woodworking stores and online. They also come in several diameters. The 1/4″ and 3/8″ diameter cutters are the best for acoustic guitars, with the 1/4 being the closest to standard fret dot size. Find a piece of wood that will be made into fret dots. Chuck the plug cutter in a drill press, and adjust the table before drilling. 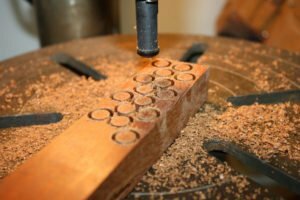 It is best to use a drill press for this operation, because it can be incredibly difficult to hold the cutter still in a hand drill. The sides of the plugs need to be straight and smooth, so any hand chatter can cause uneven plugs and poor looking inlays. The piece needs to be held very still while the plug cutter enters the surface. This can be accomplished with a clamp. Advance the cutter into the piece, going about 1/4″ into the surface. Move the piece and do the same thing over and over again, maximizing the available surface space. Once several plugs are cut, you are ready for the next step. Once the plugs are cut, they need to be freed from the piece. This can be done with a band saw or hand saw. Saw a little less than 1/4″ from the surface, and the plugs will fall off onto the table. Sometimes they will go flying across the shop, so wear eye protection. 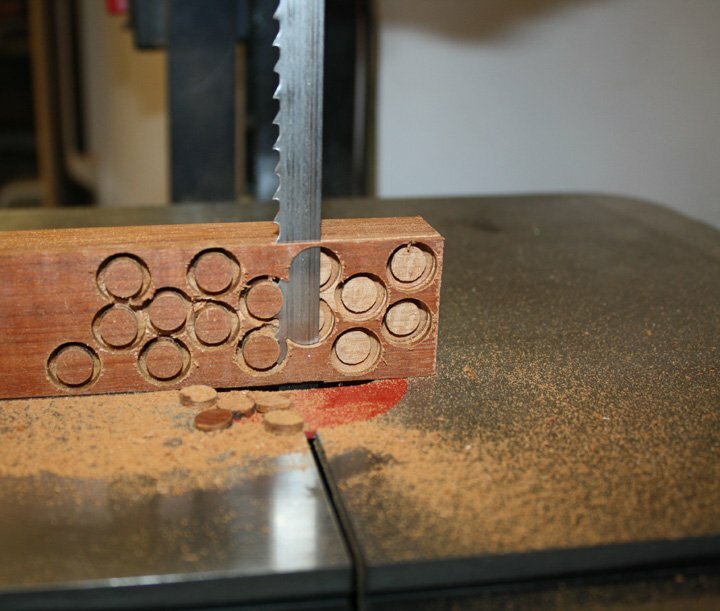 Once the plugs have been freed,the piece can be sanded flush, and used again to make even more dots. If a thickness planer is available in the shop, finish cutting off the surface and the entire piece can be sent through. After a few passes, the surface will be smooth again, and more plugs can be made. Typically, a 4/4 piece of wood will allow for two passes with the plug cutter, which minimizes the waste from the piece of wood. Plugs can be spaced pretty closely as well, so even a smaller piece can give up quite a few fret dots. Learning how to make fret dots will open your custom fretboard making ability to new wood species. It will allow you to incorporate lesser used but beautiful woods into your design. The natural dots look great too. Installation is a simple matter of drilling a hole in the fretboard that is the same diameter as the dots. 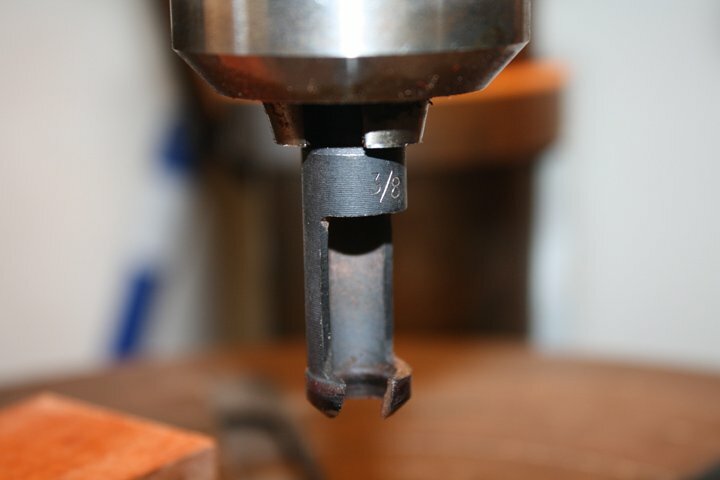 For the best hole, with the cleanest sides, a Forstner bit is by far the best drill to use. A brad point bit can be used with success as well, but I find that the Forstner is easier. Mark the location of the fret dots on the fretboard with a pencil. Then, use an awl or sharp nail to make a slight indentation on the mark. This small indent will give the center point of the Forstner bit something to sink into, and help it travel exactly where you want. Drill out all the dot locations a little shallower than the inlays, and then glue in the homemade fret dots. When applying the glue, be sure to coat the sides of the hole. It does not require much glue to secure these in place, just make sure to coat all surfaces in the cavity. After that, press fit the inlay until it seats in the hole. Wipe off any squeeze out with a wet rag, and apply small clamps to hold the dots in place. How to make fret dots is an easy process. I recommend finding lots of exotic scraps and making a small inventory. This way, any color you desire will be available to use in the shop. It is important not to press them below the surface of the fretboard. A small portion should stick out on top of the fretboard. Once dry, sand the excess wood flush to the fretboard, and the inlaying process is complete. Lastly, the little glue around the sides of the cavity will help fill in any variances in the inlay or the cavity, giving it a very precise look. 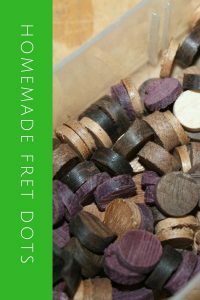 If you have any questions about how to make fret dots, please leave a comment and I will answer them. Happy building. 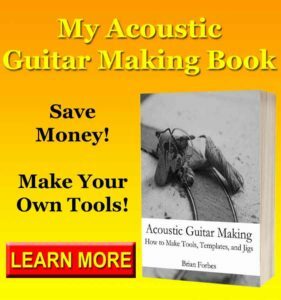 I cover many acoustic guitar making topics in my book, Acoustic Guitar Making: How to make Tools, Templates, and Jigs. There are over 500 pictures, and 1600 images, explaining many guitar making processes.